Retrieving public URL’s from Dropbox takes several steps, but Bloodrop makes it easy. Just drag a file onto the app and it will automatically upload to Dropbox and then copy the public link to your clipboard. It’s that simple. Before grabbing Bloodrop, you’ll want to have Growl (or the free Growl Fork) installed so you can be notified when a file is shared and the URL is ready. Unzip Bloodrop and copy it to the Applications folder, then launch it to configure with your Dropbox ID and destination folder for shared files. Now put the Bloodrop.app into the Dock and it’s ready to accept files. I still don’t get why the Dropbox team does not develop similar functions or better, has developed such things as a feature already. I generally love Dropbox, but don’t understand why such basic stuff is (still) missing. 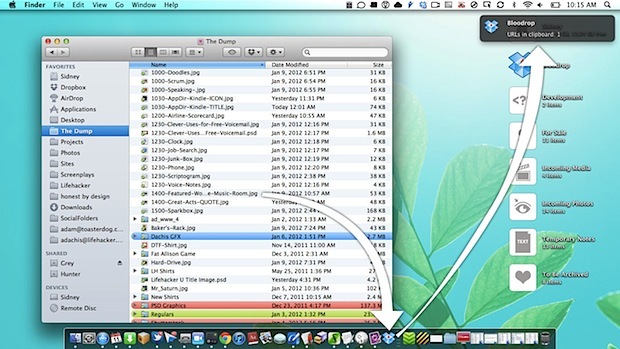 This app is for users of Dropbox and not to be confused with Drop Box which is not an app but which is on every Mac computer as a folder residing in the Public subfolder in the user’s home folder (house icon). Here are clearly written steps for the highly useful Bloodrop application which works with the app Dropbox (DB). First, get your Dropbox ID by launching Dropbox website via right click on Dropbox menu icon. Find PUBLIC folder in your collection of Dropbox folders you already have. Select any file in that public folder and right click it and choose “copy public link”. That will open a Copy Public Link box that shows the URL. The number after http://di.dropbox.com/u/ is your Dropbox user ID. It will be all numbers and usually about 7 digits. Copy that number so you can use it in step #6 below. 2. Choose the “RECOMMENDED” download. 3. Double click on the Bloodrop.app-0.1.4-binary.zip which will unzip the file into your downloads folder. 5. See it bouncing in your dock and select “Options” and choose: keep in dock. 6. Left mouse click on dock icon and it will give you message to read; click OK and it will open another box where you insert your Dropbox ID. 7. You are then done and can use Bloodrop by dragging ANY file to the Bloodrop icon on the Dock, which will give you Growl message that the URL for this file has been copied to your clipboard. So if you wished to share any file with someone, you would have dragged that file to the Bloodrop icon, then related that URL to your friend by pasting (Command-V) the clipboard in an email or in any document (Word, text edit). Agreed. This is a solution looking for a problem. It would seem so but once you have this set up with the Bloodrop Icon in the dock, all that is needed to be done is to drag the file you wish to share onto the icon and a message pops up to remind you that your clipboard now contains the URL to share the file. That’s the upside and I am all for speeding up processes. Your method above ONLY works for files in the PUBLIC folder of Dropbox. Therefore, you would first need to move the file you wish to share into the Public folder. With Bloodrop you can take any file on your computer and within seconds put it into a FOLDER name that you had already chosen during the Dropbox setup and have it shared via the created URL. That is a big difference.